With only the internet as our guide, we asked ourselves: Should we start with a rimfire rifle, the type of rifle most often used to hunt small game like cottontail rabbits? If rimfire, should it be bolt-action, single shot, or semi-automatic? Or should we start out with a shotgun? If so, should it be a 12, 20, or 28 gauge? Should it be auto-loading, pump, or break action? Within each of these broad categories, there are myriad designs and variations of guns, ranging the gamut from relatively inexpensive to ‘man, I could buy a car with that amount of cash’. The internet had answers to our questions, but they were far from straightforward. Now, a few years later, I hope that I can offer new hunters some useful perspective on small game rifles for beginning hunters. 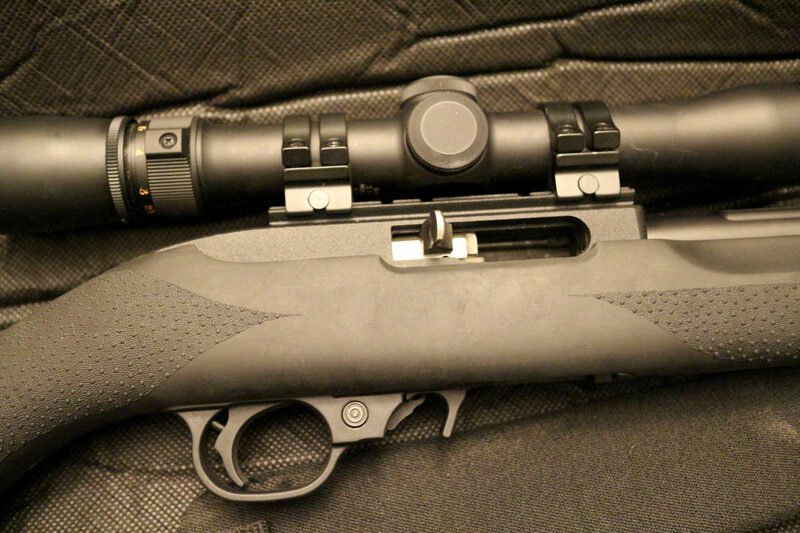 In this article I will discuss rimfire small game rifles and outline what I think to be the best option, especially if the hunter prefers to use non-lead ammunition. Small game shotgun options are on the agenda for a future post. The vast majority of rifles can be divided into two categories: rimfire and centerfire. In a rimfire rifle the firing pin strikes the rim of the cartridge, leading to igniting of the primer that ultimately results in a flying bullet. By contrast, the firing pin strikes the center of the cartridge in a centerfire rifle. (For those who want to know a bit more about the way that different types of ammunition works, check this out). Rimfire cartridges propel generally small bullets at slower speeds compared to a centerfire. 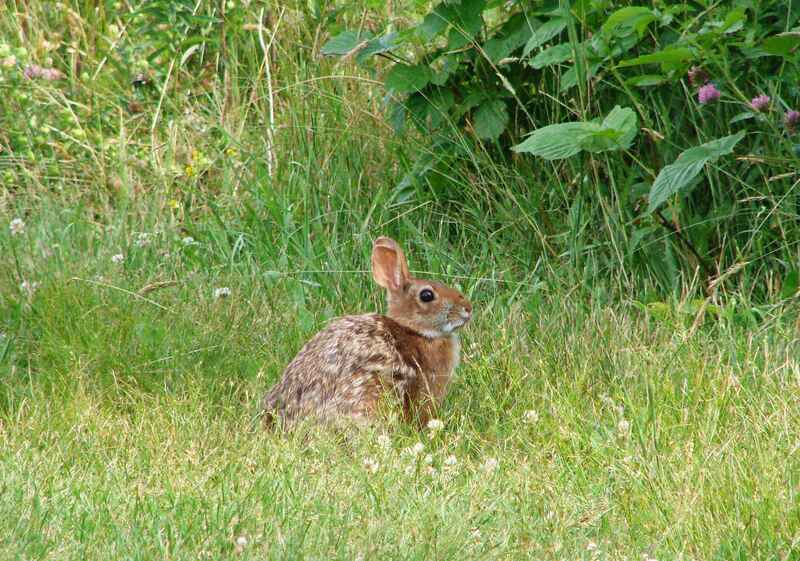 This fact ensures that the guns have minimal to no recoil (making your time at the range more enjoyable) but also limits them to use on small game animals like cottontail rabbits and squirrels. Small game aside, I think a rimfire rifle is an excellent first choice for new hunters and shooters more generally for a few reasons. First, ammunition for rimfire rifles, especially if you aren’t shooting some exotic caliber, is typically much cheaper than ammunition for centerfire rifles. Cheaper ammo can lead to more shooting, which allows for greater marksmanship development. Second, the low recoil of rimfire guns makes them a joy to target shoot with and prevents developing a shooter’s flinch that can definitely hurt accuracy (the main reason we chose a rimfire over a shotgun for small game hunting was due to the difference in recoil). Third, because of the lower power of rimfires, they make less of a ‘boom’ when fired (they’re still loud though, so wear ear protection). The intensity of the explosion from centerfire rifles can intimidate those who are new to guns (I still jump a bit when a magnum caliber centerfire with a muzzle brake goes off next to me on the range). Finally, rimfire rifles, especially entry-level ones, are cheaper on average than centerfire rifles. Many new hunters want to try hunting without dedicating a large chunk of money to it. Lower purchase price also leads to a lower absolute depreciation over time, meaning if you decide to sell your hunting equipment down the line, you will lose less money on a rimfire than you would a centerfire. There is a phrase on the internet called ‘caliber wars’. It refers to the seemingly endless debates that many forum-goers have about the best caliber for any given task. These wars rage for rifles, shotguns, and handguns alike. Fortunately, though some ‘battles’ still simmer, there is broad consensus about certain calibers. For example, the .22LR round is considered to be one of the best, if not the best, rimfire cartridge for its ubiquity and relatively low cost. The .22LR will work quite well on squirrels and cottontail rabbits (though is perhaps not quite enough for large jack rabbits). It has been one of the most popular rounds for decades and almost every hunter probably has owned or now owns a .22LR rifle. Various (lead) versions of the .22LR cartridge. Unfortunately, those who take part in these caliber wars almost never mention an important consideration for me: does the given caliber have good non-lead bullet options available? Since my primary goal in hunting is to put fresh, healthy meat on the table, the idea of potentially introducing a toxic substance like lead into my meal is somewhat unappealing. Sadly, this is where things get a little tricky for the rimfire. Much to my dismay, the .22LR does not have any good non-lead ammunition options available. I hadn’t thought about this back when I purchased the rifle years ago, but I wish I had. While the non-lead .22LR ammo that exists claims to be accurate to only fifty yards at best, in practice I’ve found the accuracy to be even less than that… perhaps forty yards for a rabbit-sized kill zone. While it is possible to get within forty yards of rabbits and squirrels, compared to the leaded versions of .22LR ammo (that I’ve found to be accurate well over one hundred yards), the non-lead ammo’s performance is dismal. So the best, cheapest, and most versatile round available for the rimfire isn’t a very good choice for those who want to hunt with non-lead ammunition. The .17 HMR would be my rimfire round of choice for non-leaded hunting of small game mammals. .17 HMR round. Note the much bigger cartridge (the brass part that contains the bullet). This allows for more gun powder and resulting higher velocities. Caliber is only one variable in rifle choice. Rimfire rifles also come in a dizzying array of ‘actions’: single shot, pump, lever, bolt, and semi-automatic are all fairly common configurations. Which should the new hunter choose? Upon consensus recommendation of the internet, I chose a semi-automatic configuration as my first rifle (in .22LR) a mistake. The reasons supporting this choice seemed robust. A semi-automatic is good for times when many shots are to be taken, like in target practice. They also allow for quick follow-up shots on animals if needed. The Ruger 10/22 was the rifle I chose, based on its extensive aftermarket support and decades-long reliability track record. It’s a great gun overall. An example of a semi-automatic action (on Robyn’s 10/22, in this case). However, I would not recommend that new hunters choose a semi-automatic rimfire. While a semi-automatic action has many advantages, it has a few drawbacks that I’ve uncovered over the years. One of the first drawbacks: the action is different from the most common action (bolt-action) associated with larger centerfire rifles. Because I think a person’s first rifle should be conceived of as a training rifle for all future rifles, a consistent action will offer more directly transmittable practice. A second drawback: semi-automatic actions tend to be slightly less accurate on average than their bolt-action counterparts. Finally, one of the advantages of a semi-automatic (quick follow-up shots) can actually be a disadvantage for a new hunter as well. If a hunter has the ability to take quick follow-up shots, they may be ever so slightly less careful with their first shot. A bolt-action might provide incentive to be more careful on that first shot. New hunters should train to make every shot a kill shot and I don’t think that a semi-automatic provides the ideal structure for that training. 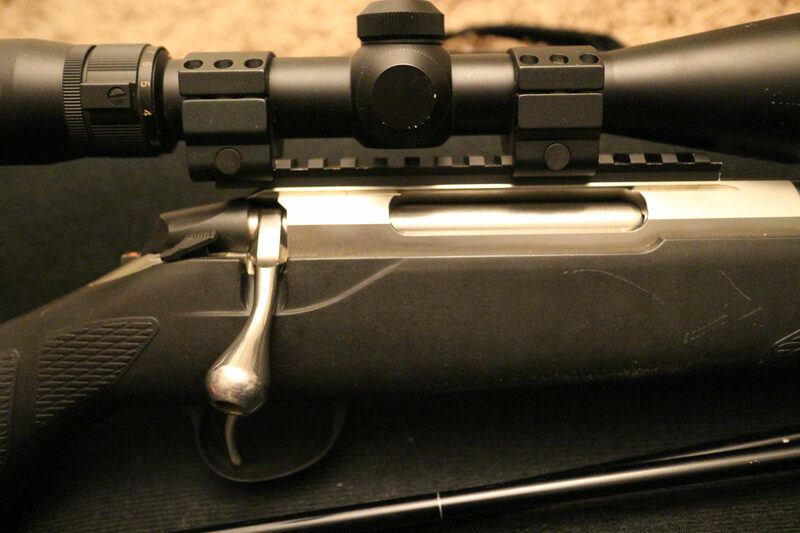 An example of a bolt action rifle (Robyn’s 25-06 centerfire, in this case). The bolt is slid back and forward to cycle each shot. As a result a bolt action has slower follow up than does a semi-automatic action. I think that a good argument can be made in favor of choosing a shotgun for use as a new hunter’s first small game gun. However, because we wanted to practice our rifle marksmanship in preparation for eventual big game hunting and because many of our shots were likely to be greater than fifty yards (outside of shotgun range), we chose a rimfire rifle first. We have found that — even for our less than ideal 10/22 — we are able to harvest small game in sufficient quantities to build our skills as hunters. For those who want information on other gun options, don’t worry. In the future we’ll break down the options for shotguns as well as for centerfire rifles. But for beginner hunters, I think the rimfire rifle is a great choice. First of all, THANK YOU! This is a great blog and I’m enjoying it. As a Hunter Education instructor and a life-long hunter, I’m pleased to see the steps you’re taking and the thought you put into things. Your processes are sound and you’re on the right tracks to be excellent hunters. That’s great, because we need more hunters like the two of you. Now, on this article, there’s a problem. Your fear of lead ammunition in .22LRs is simply unfounded. There have been trillions of head of game shot with .22LRs and not a single documented case of lead poisoning from exposure through .22LR-taken game meat. The .22LR does not fragment; it expands, and not violently. You’re shooting small, soft targets, and you will almost assuredly have a “pass-through”, where the bullet exits the offside of the animal. If you hit the head area, you’re hitting a non-edible portion anyway, but even if you hit an area you might want to eat, you’re not going to end up with any fragments in that meat at all. It simply doesn’t happen. Unless the bullet fails to exit and you happen to ingest the entire projectile, you’ve got nothing to fear. The same can be said for lead pellets in shotgun shells; unless you eat the pellet you have nothing to worry about. I realize that you both are in California, and therefore are verbotten to use lead in shotguns or centerfire rifles, but in most other states lead is the choice and there aren’t cases of lead poisoning from pellets or .22LRs unless someone ingests the entire projectile. The lead ammo issue is indeed a tricky one. I think you’re probably right: 95+% of the time in small game and shotgun contexts there is minimal fragmentation of lead ammunition. I guess I’d just like to have the option for an easy and good substitute that would allow me to avoid the other small percentage of risk. I wouldn’t say I’m ‘worried’ per say about lead ingestion in small game hunting… I did it for a couple years with no real concern, pretty much for the reasons you cite. However, there are two additional reasons why I wish that .22lr came with better non-lead options. The first is that, while I’m not super concerned about ingesting rimfire lead myself, I prefer (if possible) to avoid introducing lead into the environment where I hunt. Sure, 40gr of lead is minuscule. Sure, most of it will remain inert. But, over the course of my life, the 40gr shots will add up (I hope!). When I can easily reduce the amount of lead I put into the wild lands where I hunt, I try to. Thanks again for the comment Sean and thanks for teaching aspiring hunters!